The Streptomyces albus J1074 strain is one of the most widely used chassis for the heterologous production of bioactive natural products. The fast growth and an efficient genetic system make this strain an attractive model for expressing cryptic biosynthetic pathways to aid drug discovery. To improve its capabilities for the heterologous expression of biosynthetic gene clusters, the complete genomic sequence of S. albus J1074 was obtained. With a size of 6,841,649 bp, coding for 5,832 genes, its genome is the smallest within the genus streptomycetes. Genome analysis revealed a strong tendency to reduce the number of genetic duplicates. The whole transcriptomes were sequenced at different time points to identify the early metabolic switch from the exponential to the stationary phase in S. albus J1074. S. albus J1074 carries the smallest genome among the completely sequenced species of the genus Streptomyces. The detailed genome and transcriptome analysis discloses its capability to serve as a premium host for the heterologous production of natural products. Moreover, the genome revealed 22 additional putative secondary metabolite gene clusters that reinforce the strain’s potential for natural product synthesis. Recent advances in whole-genome sequencing have revealed that actinomycetes carry approximately 30 biosynthetic gene clusters and thus have huge potential to produce natural products. However, in practice, the majority of the biosynthetic gene clusters remain silent under standard laboratory conditions. Therefore, the main challenge in the field is to access the hidden biosynthetic potential of Actinobacteria. One approach is to clone the gene cluster on a cosmid or BAC, redesign it and then express it in a well characterised bacterial host. While identification and cloning of the gene clusters is rather straightforward, successfully expressing them in heterologous hosts remains challenging. S. albus J1074 has long been known as a suitable host for the heterologous production of versatile secondary metabolites, ranging from marine Micromonospora secondary metabolites  to potent anticancer agents . For example, this strain was used to express steffimycin biosynthetic genes , as well as fredericamycin , isomigrastatin , napyradiomycin , cyclooctatin , thiocoraline , and moenomycin  biosynthetic gene clusters. S. albus J1074 has a valine- and isoleucine-auxotrophic phenotype and is defective in the Sal I (Sal GI) restriction-modification system, which allows it to be genetically manipulated in a straightforward fashion. Its complete genomic sequence highlighted its naturally minimised size but also provided new directions for S. albus applications. Recent attempts to construct and improve a model host for the heterologous expression of genes encoding secondary metabolites have done so by deleting nonessential genes [9, 10]. However, the constructed S. avermitilis strain still possesses considerably larger chromosome than that of S. albus J1074. Genomic information can provide us with additional possibilities for optimising a given strain for heterologous production and to develop methods for the activation of otherwise silent clusters. We present the complete sequence of the S. albus J1074 genome and compare it to other streptomycetes whose genomes have been sequenced. Moreover, detailed transcriptome time series of 12, 36 and 60 hours of shake-flask cultures of S. albus J1074 have been used to profile gene expression. At 6,841,649 bp, S. albus is one of the smallest Streptomyces genomes, along with S. cattleya; however, the latter also contains a megaplasmid pSCAT (1,809,491 bp). The genome size is an interesting feature of streptomycetes biology, and the availability of its complete genomic sequence made it possible for us to attempt to explain this phenomenon. Deep analysis of chromosomal genes has shown that S. albus tends to reduce the number of orthologous groups of genes. It has also the highest known GC content (73.3%) of streptomycetes. The main features of the single chromosome sequence are shown in Table 1. Unlike those of other streptomycetes genomes, the single chromosome includes seven rRNA operons (16S-23S-5S) and 66 tRNA genes (41 species). The presence of seven rRNA operons might explain the exceptionally fast growth rate and versatility of this strain . The chromosome of S. albus J1074 contains 5832 predicted protein coding sequences (CDS). Of these CDS, 4665 (80%) could be could be ascribed putative functions, while the remaining 1172 ORFs (20%) were annotated as genes that code for hypothetical proteins. The origin of replication showed perfect symmetry and is situated exactly in the middle of the chromosome, located at 580 bp left of the centre, at 3 419 111–3 420 244 bp – this region contains 19 tandem DnaA box-like sequences and is flanked by the dnaA and dnaN genes. The central “core” that contains essential genes comprises nearly the whole chromosome from approximately 0.3 Mb to 6.4 Mb, while the “arms” were much smaller in comparison to those of S. coelicolor, with lengths of approximately 0.3 Mb (left arm) and 0.4 Mb (right arm). Therefore, its genomic topology is quite minimal compared to other sequenced actinomycetes genomes (Figure 1). Genomic sequence comparison of three Streptomyces strains. (A) S. albus versus S. coelicolor; (B) S. albus versus S. bingchenggensis were generated with NUCmer using default settings. Matches on the same strand are in red, and those on the opposite strand are in blue. The black bar at the bottom denotes the core region, which for S. albus contains almost the entire chromosome. Putative transposase genes are found throughout the chromosome in intact, truncated and frameshifted forms. Unlike S. coelicolor, in which transposases are concentrated on arms (in particular at the sub-TIR regions), virtually all insertion elements in S. albus are found in the core region (Figure 2). As such, the sheer distribution of mobile elements could be indicative of recent genomic perturbations. Of the 40 predicted transposase coding sequences, 17 form simple insertion elements, while the remainder are not bounded by inverted repeats. Most of them fall into 2 families, such as IS112- and IS1647-like elements. Notably, 30 putative transposase genes lie to the left of oriC and correlate with greater variation in GC-content DNA composition in the left half of the chromosome (Figure 2). A high degree of horizontal gene transfer can be observed 370 kb left of oriC (approximately 40 kb size), which is a region containing below average GC-content and multiple insertions of mobile elements. Features of linear S. albus J1074 chromosome. (A) GC-skew pattern of S. albus J1074 chromosome showing overrepresentation of C over G (yellow) and G over C (blue) in the strand analysed; (B) Distribution of mobile elements though the S. albus chromosome. The origin of replication is marked with a blue triangle. As previously demonstrated [12, 13], one of the IS112 insertion elements disrupted the gene for the restriction enzyme Sal I. We also identified that another IS112 element is inserted into the gene of DNA methyltransferase subunit of the Type I restriction-modification system. In addition, S. albus has only three restriction endonucleases and four site-specific methyltransferases. Interestingly, S. albus lacks the dndA-E operon involved in DNA phosphothiolation (variety of R/M-system) present in S. lividans TK24 [14, 15], which explains why the given strain does not prevent incoming DNA from adding to exceptionally high transfer rates. The taxonomic position of S. albus J1074 within the S. albus clade was obscure. First mention of this strain occurred in 1980 , in which J1074 was referred to as a Sal I system-deficient strain derived from S. albus G. Although, the origin of S. albus G is also unknown, it was used as one of S. albus strains in 1970  to analyse the LL-diaminopinielic acid containing peptidoglycans of streptomycetes. Therefore, the interesting results of the initial attempts to study the S. albus J1074 genome encouraged us to clarify the strain’s taxonomic position. The sequences of the 16S rRNA genes from all S. albus strains available in GenBank database (Additional file 1: Table S1) were compared. According to our analysis, S. albus J1074 falls into one clade with strains S. albus subsp. albus NBRC 3422, NBRC 3711 and S. albus DSM 40890. Most other strains of S. albus subsp. albus cluster very closely in one clade and share 100% sequence similarity with only one exception – DSM 40313 (Additional file 2: Figure S1). 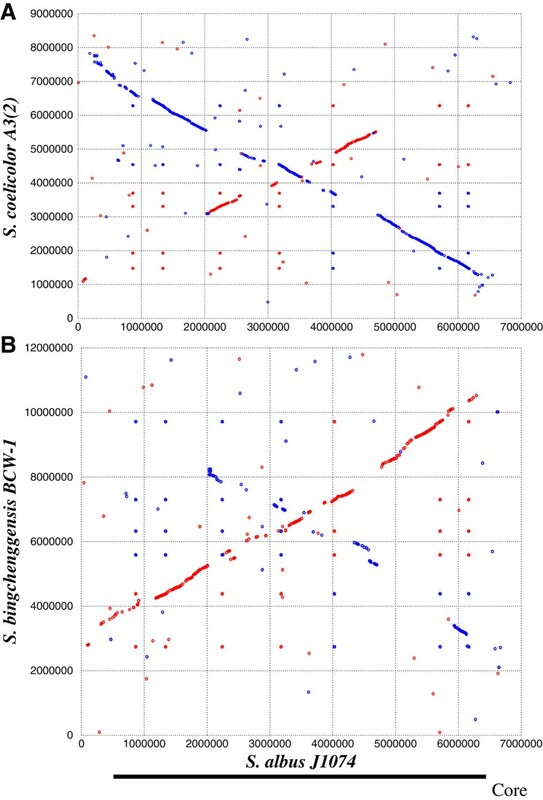 We compared the chromosomes of three Streptomyces species, namely S. albus, S. coelicolor A3(2) , and S. bingchenggensis (largest sequenced Streptomyces to date), in order to establish the loss of regions and functions through the evolution of J1074. Dot plots generated via NUCmer software clearly demonstrated the existence of a highly conserved internal core region of each chromosome even when several inversions were found (Figure 1). Relative to the S. bingchenggensis BCW-1 genome, S. albus J1074 lacks 4.5 Mb on its chromosomal arms. 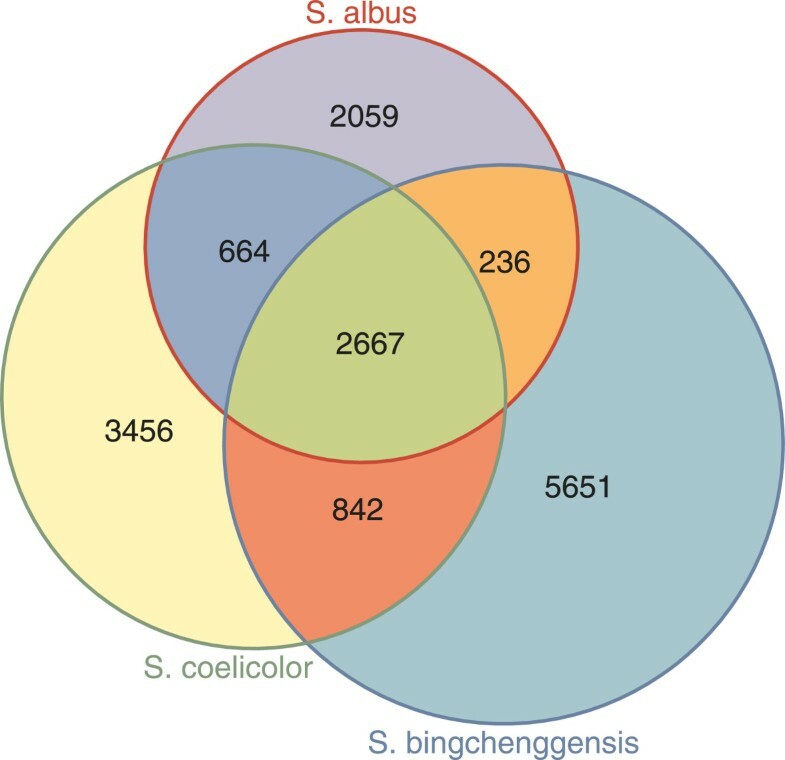 We clustered S. albus J1074, S. coelicolor A3(2), and S. bingchenggensis BCW-1 proteins using the BLASTCLUST program with a threshold of 60% identity plus 70% length coverage (Figure 3). As such, 2811 S. albus J1074 proteins (48% of the total proteins), 2947 S. coelicolor A3(2) proteins (38%), and 2988 S. bingchenggensis BCW-1 proteins (30%) were classified into 2667 clusters that are commonly present in these three species. We also found 842 clusters that are absent in S. albus but present in both S. coelicolor A3(2) and S. bingchenggensis. BLASTCLUST classification of proteins into clusters. A total of 5851 S. albus, 7768 S. coelicolor, and 10022 S. bingchenggensis proteins were classified. The number of shared and unique clusters, not proteins, is shown. S. albus lacks the whiE gene cluster (SCO5320 to SCO5214), which is involved in the biosynthesis of an aromatic-polyketide spore pigment . Additionally, we found that the bldK genes (SCO5112 to SCO5116), which encode a peptide transporter involved in morphological development in S. coelicolor A3(2) , are not present in S. albus. However, S. albus contains multiple other peptide transporter systems, one of which may function as the BldK system. Streptomyces sp. linear plasmids and linear chromosomes usually contain conserved terminal palindromic sequences bound to the conserved telomeric proteins Tap and Tpg, which are encoded by the tap and tpg genes, respectively . However, we were not able to identify the tpg gene in S. albus. A gene-encoding Tap domain-containing protein is located on the right end of chromosome (XNR_5804) and upstream of a pseudogene of protein with DNA-binding properties. However, as in the case of S. griseus, these genes appear to be non-functional . While Kirby et al. noted that S. albus lacks these genes possibly due to circular chromosome, this seems not to be the case, as the only replicon it has is linear. Therefore, we assumed that S. albus acquired a novel pair of Tpg and Tap proteins that have yet to be identified, as it was described for multiple linear streptomycetes plasmids . Another interesting feature of S. albus genome is the absence of the gamma-butyrolactone system. We were not able to identify genes for signal molecules biosynthesis with the exception of one gene-coding protein of the TetR family, which shows homology to gamma-butyrolactone binding protein. Taking into account the size of the S. albus genome, we suggest that it was lost during chromosomal rearrangements. The A-factor instability of S. griseus is well known and is explained by the location of the afsA gene in the vicinity of one end of the chromosome . Therefore, due to deregulated signalling mechanisms, this strain could have acquired a genuine, permanent capability of heterologous production of secondary metabolites. A total of 520 genes (8.9%) are predicted to be involved in regulation. S. albus J1074 codes for 35 sigma factors, which is a small number relative to other streptomycetes, such as S. coelicolor (65) and S. avermitilis (60), etc. Of these 35 sigma factors, 25 are “ECF” (extra-cytoplasmic function) sigma factors, which respond to external stimuli and activate genes involved in responses to different stresses, cell-wall homeostasis and aerial mycelium development. As with other streptomycetes, S. albus J1074 also has abundant two-component regulatory systems. Our analysis has revealed the presence of 60 sensor kinase genes, 42 of which lie adjacent to genes encoding response regulators that form two-component systems. In addition, there are 19 orphan response regulators encoded in this genome. In comparison, the S. coelicolor genome encodes 67 two-component systems . There are also 27 genes encoding serine/threonine protein kinases in S. albus genome. As the number of two-component signal transduction systems encoded by a bacterial genome usually is proportional to the size of the genome  and reflects the range of signals to which bacteria can respond , we estimate that signal transduction is one area in which S. albus has retained the majority of its functions (i.e., extracellular signals). The genes encoding members of previously described regulator many families such as LysR, LacI, ROK, GntR, TetR, IclR, AraC, AsnC, ArsR, DeoR, MarR and MerR are present in the S. albus J1074 genome. In addition we identified 33 putative DNA-binding proteins. A total of 442 genes (7.2%) appear to be involved in transport into or out of the cell, the majority of which are ABC transporters. Among these are permeases, ion-, amino acid-, peptide- or sugar-binding transporters, or ATP-driven membrane transporters. In addition, S. albus J1074 has features that still allow extensive exploitation of rich media sources. A wide range of degrading enzymes, including multiple proteinases/peptidases, seven chitinases, two glucanases, two amylases and one cellulase are predicted to be secreted from the cell. Presumably, these enzymes play a key role in breaking down the heterogeneous alternative food sources in soil. Having all the necessary features of a streptomyces genome, S. albus tends to exhibit minimised duplication of genes and operons. For example, S. albus contains one gene for chloramphenicol resistance, while S. coelicolor carries two genes: clmR1 and clmR2. In S. coelicolor, two sets of genes are responsible for the biosynthesis of wall teichoic acids (WTA): SCO2589-SCO2590 and SCO2979, SCO2998 . Among these, glycosyltransferases play a central role for WTA production , including SCO2981, SCO2982, SCO2983, SCO2997, SCO2589, SCO2590, SCO2592. S. albus contains only three genes for such glycosyltransferases: XNR_1871, XNR_1873 and XNR_1874, all of which are located in a single cluster. The S. albus genome has also been minimised in regard to the chaplin family proteins. The chaplins are surface-active proteins that comprise two classes: short chaplins and long chaplins [31, 32]. The number of short and long chaplins varies from species to species. S. coelicolor has three long chaplins (ChpA–C) and five short chaplins (ChpD–H). ChpC, ChpE and ChpH are a minimal set conserved among Streptomycetes . S. albus contains orthologs of those three short chaplins, XNR_5022 (chpE), XNR_5152 (chpH) and XNR_5153 (chpC) and of two long chaplins, XNR_2152 (chpA) and XNR_2151 (chpD). S. coelicolor carries three operons for nitrate reductase complexes, where NarG plays central role and there are three nar genes – SCO0216 (narG2), SCO4947 (narG3) and SCO6535 (narG). In contrast, S. albus contains only one cluster of genes for nitrate reductase, in which XNR_0412 (narG) codes for the putative alpha chain of nitrate reductase. Additionally, J1074 contains only one cluster of genes for gas vesicle synthesis: XNR_4422 - XNR_4431. The chromosome of S. albus helps to explain another distinctive characteristic of its laboratory cultivation: that the bacterium’s spectrum of resistance is not as diverse relative to S. coelicolor (Additional file 3: Table S2). There are 17 beta-lactamase genes and 17 dioxygenases related to the bleomycin resistance proteins, 5 rRNA methyltransferases, 5 aminoglycoside acetyltransferases and 18 other genes associated with its antibiotic resistance. Detailed examination of the genome revealed that S. albus J1074 contains an ortholog of SCO1321 – XNR_5511 (a tuf3 gene encoding elongation factor, TU-3, which confers complete resistance to kirromycin and GE2270A) . XNR_5423 is an ortholog of RpbA (SCO1421), an RNA polymerase-binding protein that occurs in actinomycete bacteria and confers basal levels of rifampicin resistance in S. coelicolor. Regarding chloramphenicol resistance, S. albus contains XNR_2375, an ortholog of CmlR1 (SCO7526), while CmlR2 is absent . Genes are present for efflux proteins for daunorubicin (XNR_2457-58, XNR_4042-43), camphor (XNR_2486-87), bicyclomycin (XNR_0140), tetracycline (XNR_3352) and one putative macrolide glycosyltransferase (XNR_4394). S. albus contains two genes for tryptophanyl-tRNA synthetase: XNR_3910 and XNR_3513, of which the latter is an ortholog of indolmycin-resistant Trp-synthetase from S. coelicolor. It is worth noting that the van-cluster involved in vancomycin resistance is absent from the S. albus genome. Another interesting feature of this strain is that S. albus displays sensitivity to moenomycin with a survival rate of 0.001% at 1 μg/ml, while S. coelicolor and most streptomycetes strains are naturally resistant to this antibiotic . As the major targets of moenomycin are transglycosylases involved in peptidoglycan biosynthesis, we examined the penicillin-binding proteins (PBP) genes of S. albus more closely and found that it contains 17 genes for PBP that show a high degree of homology to the PBP genes of S. coelicolor. Among those identified, XNR_2983, XNR_2736, XNR_4127, and XNR_1770 belong to the PBP-A class, while 6 genes fall into the PBP-B class. The C class is comprised of 7 genes for PBP in S. albus. However, analysis of amino acid sequences and domain organisation of PBP-A revealed no significant differences from those in other bacteria. Moreover, transglycosylase domains of PBP from S. albus contain all 5 sequences required for moenomycin binding . Thus, it is likely that moenomycin susceptibility is not dependent on specific PBPs but, rather, on other structural or functional changes of the cell wall biosynthesis machinery. Genomic sequencing has revealed 22 clusters for biosynthesis of secondary metabolites (Figure 4). The distribution of these clusters is not uniform within the chromosome, as 7 clusters are located on chromosomal arms, and the remaining 15 are in the large “core” region that contains most of the essential genes. Of the 22 clusters, 4 were estimated for terpene biosynthesis, 11 for polyketides or non-ribosomal peptides, 2 for siderophores and 5 for lantibiotics and others. Biosynthetic gene clusters identified in the genome of S. albus J1074. Of the five terpene synthase genes, XNR_0271 and XNR_5685 are classified as phytoene synthases, while XNR_1297 is a germacradienol/geosmin synthase. Furthermore, XNR_1580 codes for terpene cyclase containing a metal binding motif and XNR_0267 encodes a putative squalene-hopene cyclase. Similar to other actinomycete strains, S. albus J1074 has 11 gene clusters that contain putative PKS (2), nonribosomal peptide synthetase (NRPS) (5), and PKS-NRPS hybrid genes (4). Unusually, among the few polyketide biosynthetic gene clusters, there is no type II PKS responsible for the biosynthesis of polycyclic aromatic compounds. One of PKS1 clusters (XNR_5853-XNR_5873) is identical to gene cluster of Streptomyces sp. FR-008 for biosynthesis of a heptaene macrolide antibiotic FR-008/candicidin . The fact that the given cluster is cryptic in S. albus and that the antibiotic structure is known can be used as a model for discovery of regulatory mechanisms repressing expression of gene clusters. Large non-ribosomal peptide synthetase XNR_5634 from NRPS cluster confined to the genes XNR_5613-XNR_5651 shows homology to indigoidine synthase, which is responsible for the biosynthesis of the blue pigment indigoidine. An NRPS gene cluster (XNR_0200 to XNR_0211) exhibits homology with SACTEDRAFT_2283 to SACTEDRAFT_2289 of Streptomyces sp. ACTE ctg00033. Total transcriptome sequencing was performed using the strand-specific Illumina protocol, which was used to generate more than 192 million short reads. The large volume of data helped considerably in the annotation process, during which the coding sequences and their lengths were adjusted in order to not to controvert known transcript boundaries. Coding sequences in the genome represent a variety of transcription levels, with several abundant transcripts occupying the majority of the mRNA pool of the cell. Such overrepresented transcripts are exclusively of hypothetical function or are involved in the stress response. A comprehensive list of loci from S. albus J1074 and their respective transcription levels can be found in Additional file 4. To establish whether S. albus J1074 is indeed outpacing other Streptomycete strains by the timing of metabolic transition to stationary growth phase, we performed strand-specific total RNA sequencing at several time points of growth in liquid TSB medium. Next, we analysed subsets of genes responsible for protein biosynthesis, phosphorus and nitrogen metabolism, morphological differentiation and sporulation. A subset of genes coding for ribosomal proteins and other proteins with functions in protein biosynthesis exhibited continually decreasing transcript levels during growth in the conditions tested. These genes were initially highly expressed but began to decline gradually as the cells entered the transition and stationary phases (Figure 5). The major change in expression occurred at or before 12 h from the point of inoculation, which perfectly correlates with the growth curve of S. albus. This point in time is regarded as a point of metabolic switch under the laboratory conditions tested. The onset of the stationary growth phase is also usually marked by a strong upregulation of the pho-regulon, which is controlled by the two-component kinase/regulator system of XNR_5270 (phoP) and XNR_5271 (phoR). Indeed, transcript levels of those genes began to increase as soon as phosphate was depleted from the medium (from 12 h - 36 h) (Figure 6). Transcription levels of ribosomal proteins. Transcription levels measured in FPKM of genes coding for the genes encoding ribosomal proteins S8 (XNR_3743), L6 (XNR_3744), L18 (XNR_3745), S5 (XNR_3746), L30 (XNR_3747) and L15 (XNR_3748) at 12, 36 and 60 h after culture inoculation. Transcription levels of PhoPR regulatory system. Transcription levels measured in FPKM of XNR_5270 (phoP) and XNR_5271 (phoR) genes at 12, 36 and 60 h after culture inoculation. The expression profiles for genes for nitrogen metabolism, and its key regulator glnR[41, 42], also decreased after 12 h. As growth ceases, the amount of transcripts and levels of corresponding enzymes for purine, pyrimidine, and amino acid biosynthesis are reduced. The early expression of these genes is particularly surprising as nitrogen was not limiting in the medium used. Transcripts of genes that are central to nitrogen metabolism, such as XNR_1223 (GlnK), XNR_1222 (GlnD), XNR_1224 (AmtB), XNR_5568 (UreA) and XNR_4658 (GlnII) were detected in the early time points but rapidly decreased until they were nearly undetectable as cultures continued to grow. As described for S. coelicolor, the expression profiles of genes for major glutamine synthetase (GS), GlnA (XNR_4684), NAD-specific glutamate dehydrogenase GDH (XNR_1879), and aspartate aminotransferase AspC (XNR_3703) were maintained at high levels up to the 60 h time point. While S. coelicolor has 5 GS-like genes, S. albus J1074 contains four genes for glutamine synthetase: XNR_4684, XNR_4658, XNR_4631 and XNR_5219. Interestingly, transcript levels of the GS-like gene XNR_4631 increase from the 12 h time point and amounts of XNR_5219 became nearly undetectable after 12 h. Therefore, the rapid drop in the levels of the GlnR-regulated gene products occurred at or just before the cessation of growth (12 h). This indicates that without the demand for amino acid, purine and pyrimidine biosynthesis, the nitrogen levels in the medium become less of a limiting factor. The expression of developmental genes increases as the cells prepare for differentiation during a metabolic switch. The expression of whiA is stable from 12 h to 60 h, while whiB levels off gradually after 12 h. Both whiA and whiB are required for the switch from elongation to division in aerial hyphae. Gene whiA constitutes, together with whiB, a whiG-independent converging pathway that controls sporulation in aerial hyphae. The whiP gene rapidly increases in expression at 12 h and then declines as rapidly to very low levels of expression. WhiP influences the coordination of aerial hyphal extension and septation, possibly by inhibiting cell division until the correct moment . The expression of whiG, which encodes an RNA polymerase sigma factor and is a target of BldD repression, gradually decreases from 12 to 24 h and is maintained at one level until 60 h. These data support our evidence that S. albus sporulates in liquid culture  and that this process begins approximately 12 h.
Interestingly, the transcription of all of the chp and rdl genes is activated during submerged sporulation with the peak at the 12 h and shows significant levels of expression, which implies that expression of chaplins and rodlins is an obligatory part of the sporulation program, regardless of whether it occurs on plates or in liquid culture. This was also recently demonstrated for S. venezuale. Of note, we could not detect any transcription for gene XNR_3803 (whiD). Among bld-genes, which play a crucial role in Streptomyces differentiation, the highest level of expression was shown for XNR_2837 (bldC), which increased from 12 h onward. Genes such as XNR_1132 (bldB), XNR_3804 (bldM), XNR_2706 (bldG) and XNR_3527 (bldN) demonstrate that peak expression occurs near the point of metabolic switch and then gradually levels off to produce constant transcript levels until 60 h.
Transcriptome analysis showed that clusters of genes for secondary metabolites in S. albus J1074 are cryptic. Only clusters for ectoin biosynthesis demonstrate detectable levels of expression that increase after 12 h. Other clusters showed extremely low levels of transcription that can even decrease into the stationary (biosynthetic) growth phase. The complete genome of S. albus J1074 was sequenced and compared to the other completely sequenced genomes of S. coelicolor A3(2) and S. bingchenggensis. The S. albus genome shows an interesting trend of minimisation via deletion of gene and operon duplicates. In addition to providing new insight into genome evolution, the genomic sequence is a good starting point for further S. albus optimisation for biotechnological application as a host for the heterologous production of natural products. The transcriptome analysis revealed the early metabolic switch in S. albus correlating with the fast growth of the strain. An ordered BAC library covering the genome was constructed to permit the ready application of RedET PCR-targeted gene disruption  to this species. The Himar1 and Tn5 transposons, site-specific recombinases and gusA–based reporter system applied for this strain enable very efficient and fast genome engineering of S. albus[47–49]. Its fast and dispersive growth is an attractive characteristic, along with sporulation in liquid culture; these properties prompted us to present S. albus as a new model strain for not only heterologous expression experiments but also for investigations of fundamental actinobacterial biology issues, such as growth, morphogenesis, cell division, cell wall formation and antibiotic resistance. The genome was sequenced using a combination of Illumina and 454 sequencing platforms. A total of 2.6 Gb of raw data was obtained, which represents a 377-fold coverage of the genome. High-molecular-mass genomic DNA isolated from S. albus J1074 was used to construct small (300 bp) and large-insert (4 kb and 40 kb) random sequencing libraries. Reads were assembled into 76 contigs using MIRA software . BAC library of 50–70 kb (pSmart) with 9-fold genome coverage was prepared and end-sequencing (2x500 bp) was performed to provide refined contig relationships. The paired-end information was then used to join contigs into one scaffold. Gaps were closed by primer walking using specially designed PCR primers. An estimated error rate of 1 per 100 000 bases was endued to the consensus sequence. The final assembly was confirmed by pulsed-field gel electrophoresis restriction pattern using the enzymes Ase I, Bcu I and Mau BI (Additional file 5: Figure S2), which have infrequent recognition sites in GC-rich DNA. 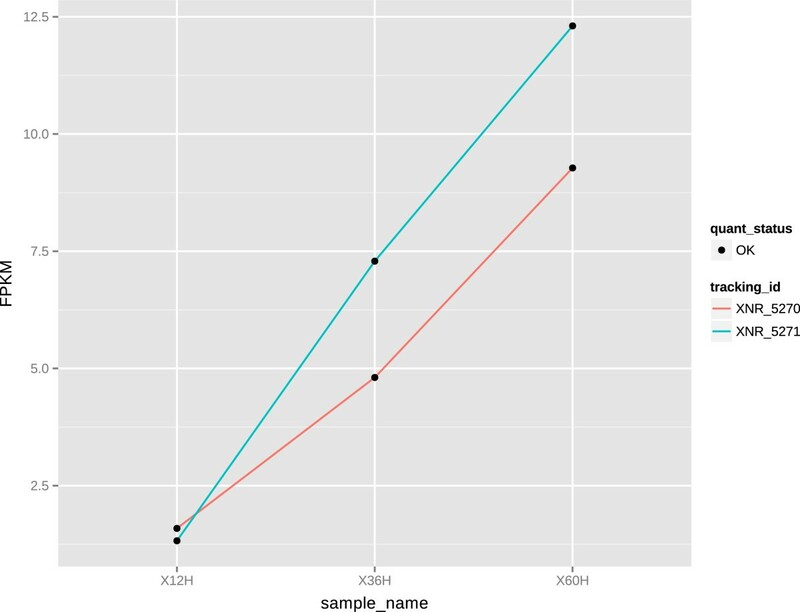 A GC-skew plot was generated using DNAplotter  software using a window size of 20 kb. 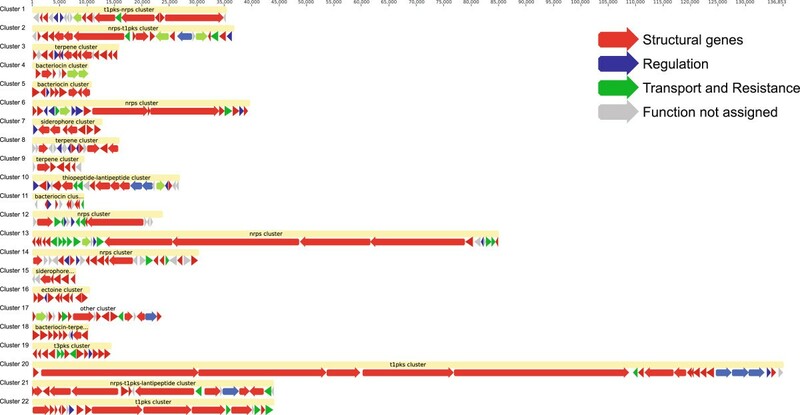 Putative protein-coding sequences were predicted using the Prodigal  and the Rapid Annotation Server . Manual curation of all coding sequences was conducted by examining the database hits of BLASTP  program with KEGG , RefSeq , and CDD  databases and the results of analyses with FRAME PLOT . In some cases, the origins of leaderless transcripts were adjusted using RNA-Seq data. The tRNA and transfer-messenger RNA genes were predicted using the tRNAscan  and rnammer , respectively. 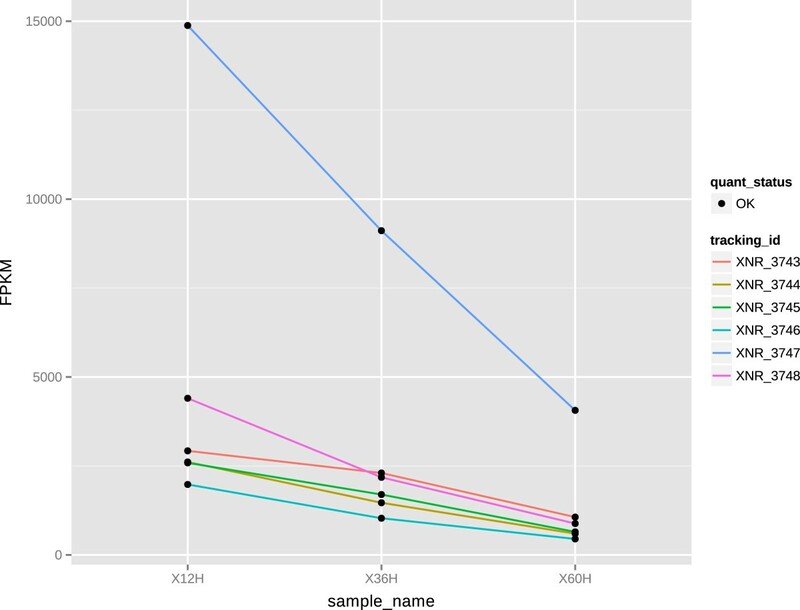 Clustering of protein families was performed with BLASTCLUST  with minimum 60% identity and 70% length coverage. Interproscan  was used to confirm domain assignments. NUCmer software was used for Streptomyces genome comparison . Secondary metabolite gene clusters were predicted in antiSMASH  with additional manual curation. The pre-cultures of S. albus were prepared by placing a single colony from TSB-agar plates into a 500-ml flask with ribs (4 ribs, Labor-Ochs, Cat. No 120500) containing 5 matte glass balls (4-mm diameter, unknown source) containing 50 ml (1.5 g TSB (Fluka Analytical, T8907-1KG) + 50 ml of distilled water) of liquid TSB. Pre-cultures were grown for 24 h in Infors Multitron Standard shakers at 150 rpm at 28°C. Subsequently, 5 ml (10% v/v) of the pre-culture was transferred into each of the new flasks with the same amount of media, ribs and balls. To account for the additional volume, 5 ml of TSB was discarded prior to addition of the culture. The flasks were then placed back in the shaker with the same parameters and each was removed upon reaching the appropriate pre-set time point. The entire liquid content of the flask was finally poured into a 50-ml Falcon Tube and spun at 5000 rpm for 10 minutes (Hettich Universal 320 R centrifuge with a 1617 rotor yields 3270 RCF). Supernatants were discarded and the wet pellets were frozen at −80°C and stored on dry ice for library construction and sequencing in the following days. The nucleotide sequence of S. albus J1074 genome has been deposited in the GenBank database under accession number [GenBank:CP004370]. This work was supported through funding from the ERC starting grant EXPLOGEN No. 281623 to AL. NZ MR performed genome assembly, finished the sequence, performed annotation, comparison, RNA-Seq studies and wrote the manuscript; BO performed disc diffusion assays and helped with manuscript writing; VF helped with valuable recommendations for this manuscript; AL proposed the study, participated in its design and coordination and helped to finish the manuscript. All authors read and approved the final manuscript.